Join our yearly group of 75 interns and work on a professional team in our graduate and professional programs on campus and in hospitals near campus. You'll work for up to 10 hours per week during the school year. Experiences are as varied as the internship locations, and you'll have the opportunity to immerse yourself in a professional setting while completing health and science-related projects. This is also a great opportunity to grow your professional network. As an intern, you will complete an electronic portfolio and showcase your project work at the LHSI poster session in April. You are also eligible for the MED-I 200 course to record the experience on your transcript and may apply for a travel grant to attend a conference or national professional meeting. Many interns go on to participate in other campus programs or stay at the internship site under other funding. Are you interested in applying for our next group? Visit the application page for more information. The application process begins in late January for the following school year. The skills and outlook I developed during my LHSI internship still shape the way I look at problem solving in the clinical environment. As part of LHSI, you are supported from the application through the end of the internship. We hold information sessions and other opportunities for you to receive help with the application. After you're selected for an interview, we will meet to discuss the expectations and what you can do to prepare. After you're matched with a site, we hold orientation and other workshops throughout the year to make sure you're getting the most out of the experience. Need additional help? We have former interns serving as ambassadors. No question is too big or small; they will help you navigate common workplace issues or questions and can even look over wording if you aren't sure how to ask a question at your site. The ambassadors are also available to help students with questions they may have as they work through the application process. GoalsExplain and analyze you career goals. "Use your internship experience to help inform your career decision. You may have firm aspirations to attend medical or graduate school, but don't be surprised if you discover new interests that open unexpected pathways. Use your internship as a time to explore your options, gain new perspectives, and decide what you would like to do postgraduation." An intern is only eligible to receive the grant once (for one trip), and we are unable to fund international travel at this time. Please review estimated costs before applying; some locations like Hawaii, Alaska, Puerto Rico, and some major cities will cost beyond the $1,500 maximum that we can cover. You are encouraged to apply for other grants to help cover the total cost beyond our amount. Preference is given to interns presenting their work and those attending events with a career development component. Seek opportunities to attend conferences or meetings related to your internship, career, or academic goals. Be sure you have filled out the application in its entirety, including estimated expenses and other sources of funding. Application deadlines for the 2018–19 academic year are September 7, January 25, and May 17. Applications are only reviewed on the deadline dates. Apply for the deadline that is at least six to eight weeks prior to your trip. Decisions are sent to applicants within one to two business days after the deadline. All student travel must comply with IU travel policy. Travelers (employees and nonemployees) will have 60 days from the return date of their trips in which to submit travel reimbursement claims. Reimbursements submitted after this 60-day period will be considered taxable income. After 120 days from the return date of the trip, there will be no reimbursement. Indiana University Foundation funds may not be used for the reimbursement after this time period.
. . . take advantage of the travel grant. Networking within IUPUI and other internship sites opens many doors for you, and traveling to a scientific conference will open even more. Read how our supervisors make a difference and what brought them to LHSI. Read how participation in LHSI helped alumni with their future endeavors. Every April, interns from the Life-Health Sciences Internship Program gather to present posters of the work they've done over the course of the year. Save the date! 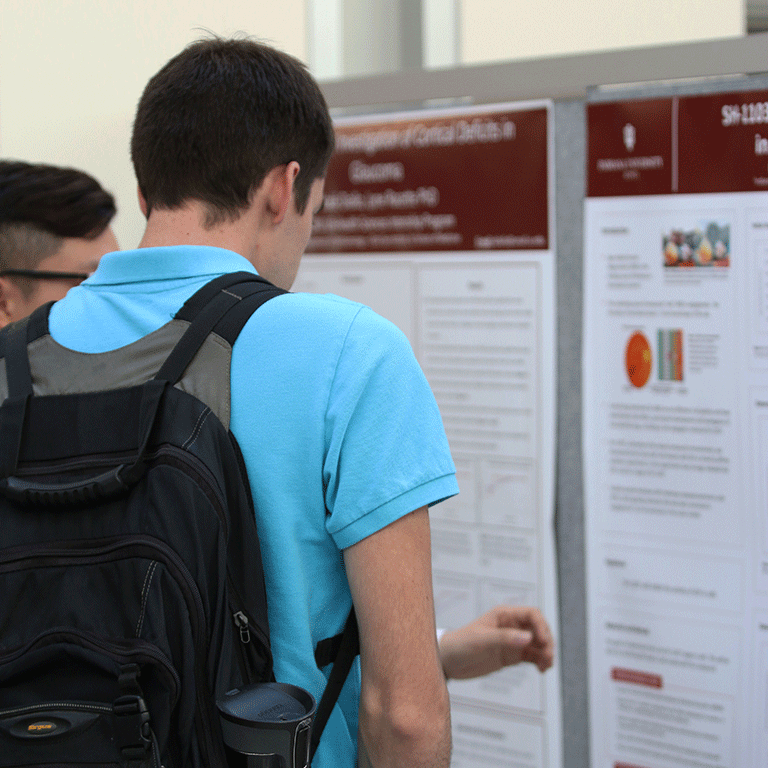 The Spring 2019 Poster Session will be held on Friday, April 12, 2019, 3–5 p.m., in the Campus Center as part of the IUPUI Student Research/Innovation and Creativity Event.